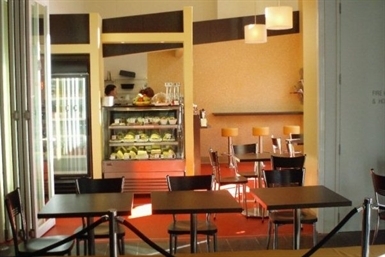 A little spot for the local North Mel­bourne community to enjoy a myriad selection of tasty delights is Cafe 99. Located in the Victorian Archives Centre on Shiel Street and owned by local Tony Tiganis, it’s the perfect place to go for a simple coffee and a quick pastry. Cafe 99 isn’t one of those large, open-spaced cafes packed with noisy customers where you are charged $25 for breakfast — rather it is a return to the basics, somewhere that shows that basic can still be so good. Tony Tiganis’s 25–30 years of experience in the food industry prepared him well to achieve his dream of owning a little cafe for customers to stop off and refuel. Places such as Caterina’s Cucina e Bar (Queen Street), Mietta’s restaurant (Collins Street) and the dining room in North Mel­bourne’s Town Hall Hotel are just some of a host of places where Tiganis has worked. It is therefore no wonder that Cafe 99 deliv­ers well-thought-out and well-prepared food. Soon after he left the Town Hall Hotel, the Victorian Archives Centre opened and Tiganis excitedly approached them with his plan to establish a small cafe. Tiganis, who is from a Mediterranean back­ground, has worked in a number of European restaurants and this influence is unmistakable at Cafe 99. The menu is inspired by Tiganis’s family background and also draws on the databank of delicacies he’s cooked in his 30 years working in hospitality. His most popular dishes are the cheesecakes, orange cakes, Portuguese tarts and — my personal favourite — the savoury three-cheese muffin, which consists of feta, halloumi and mozzarella and melts delightfully in your mouth. A gem in the heart of the North Melbourne community, Cafe 99 is going strong despite possible competition from larger cafes opening once the Woolworths is established.